IN a former number we published a short sketch, entitled as above, [See Celtic Magazine for March 1881] of Donald Macleod, who was, in many respects, a most remarkable character. Recently we came across a rare pamphlet, written in 1791, giving full particulars of the life and exploits of this extraordinary Highlander, who was then still alive, in the 103rd year of his age. As some readers may not have seen the previous notice of Macleod, we shall give a short resumé of it as an introduction to a more complete account of his career. Born of parents connected with the best families in Skye, his father being Macleod of Ullinish, and his mother one of the Macdonalds of Sleat, he yet, through a variety of family misfortunes, had no better provision made for him than being apprenticed to two brothers of the name of Macpherson, stone-masons, in Inverness. Here he found his life so hard that, after bearing it for two years, he ran off, without a penny in his pocket, in the midst of winter, and made his way, through many difficulties, as far south as Perth, where he obtained a comfortable home with a worthy man, named Macdonald, who took the friendless lad in as shop-boy, and never had cause to repent his kindness, for young Macleod served him well and faithfully, until the martial spirit of his ancestors was roused within him, by the appearance in the- town of a recruiting party. Young Donald, although only thirteen years old, and small of stature, was so determined to enlist that, though told by the recruiting serjeant that he was too young and too small, he persistently followed the man about until at last he was induced to speak to his Captain about him. This gentleman, who turned out to be a Macdonald from Skye, on discovering that our hero was the son of a gentleman, and also a relation of his own on the mother's side, consented to enlist him, took him under his protection, and promised him speedy promotion if he proved himself worthy of it. Thus, Donald Macleod entered the army at the early age of thirteen, to serve King William III., as a private in the Royal Scots, then commanded by the Earl of Orkney; and it is at this point of his chequered career that we resume the narrative of his life. On returning with the recruiting party to Edinburgh, the headquarters of the regiment, his Captain introduced Donald to the Earl of Orkney, who, struck with the determination and spirit of his young recruit, received l'im with great kindness; and, being informed of his good birth, took special care in having him well seen after. Donald must have given satisfaction to his officers, for, in about four years, we find him raised to the rank of serjeant, and sent into Inverness-shire, in command of thirty men, and a considerable amount of money, to raise recruits for the Royal Scots, then ordered on foreign service. Macleod, although only about seventeen, executed this duty to the entire satisfaction of his officers, and soon returned with a large number of recruits. Shortly after he embarked with his regiment for Flanders. Here he saw plenty of active service, for the Royal Scots were engaged in nearly all the battles of the campaign, such as Schellenberg, Blenheim, Ramillies, and many minor engagements, in all of which Macleod acquitted himself well and bravely, and, fortunately, escaped without a single wound. By diligent practice he had become by this time a very expert swordsman, which, combined with his high spirits and almost reckless courage, caused him to be regarded by his comrades and officers as the champion of the regiment. This circumstance, added to his own hasty temper, involved him in a number of private encounters or duels, in which he always had the good fortune to come off victorious. The first of these took place in 1713, during the temporary cessation of hostilities that preceded the peace of Utrecht. While walking quietly round the ramparts of the town in which his regiment was quartered, Macleod was rudely addressed by a French serjeant, who taunted him on the inactivity of the British army. He sharply replied, and in a minute he and the Frenchman were abusing each other in a torrent of words, in which French, German, English, and Gaelic were commingled. A challenge was quickly given by the Frenchman, and as quickly accepted by the Highlander; and at the time and place ap. pointed they duly met to decide their quarrel with the sword. In a short time the Frenchman fell mortally wounded; when, with his last breath, he acknowledged having been the aggressor, and, giving his watch to Macleod, begged him to accept it as a peace offering. Shortly afterwards peace was concluded, when the army prepared to return home. Pickets were sent out to bring in deserters, and Serjeant Macleod went with a party for this purpose to the town of Breda, where he found two deserters. On seizing them, he was accosted by a French officer, who declared that he had just enlisted the men in the French service, and swore that he would keep them. Macleod was as determined to take them, and the altercation between the two ended by the Highlander challenging the Frenchman, who, being a lieutenant, had to get permission from his superior officer to fight a duel with a man inferior in rank. This being secured, the two immediately set to; but the lieutenant was no match for Macleod, and was soon disabled. The two deserters were at once give up on the Highlander paying the enlistment money which the men had received, and already spent. On another occasion, when quartered at Lisle, the Skyeman was taking a walk with two ladies, when a German trooper passed, and, with a scowling brow, muttered in German, "The devil take the whole of such dogs !" "What is that you say?" exclaimed Macleod, starting forward. The German repeated the malediction, when, in a second, he found Macleod's sword flashing in his face. This was too much for the German's courage, and he took to his heels. A German officer, however, who had witnessed the affair, annoyed at his countryman's pusillanimity, rushed forward, sword in hand, and fiercely attacked Macleod, who, confident in his skill, cooly parried the officer's blows, and soon found he would have no difficulty in disposing of his opponent; but having no personal grievance against the German, and admiring his courage, he determined not to kill him, but to give him a good lesson, and by a rapid pass he sliced off a piece of the German's fat leg, and asked him if he was satisfied with that On receiving an answer in the negative, he wounded him smartly in the sword arm, when the German said "It is enough." Macleod then assisted his late opponent to his quarters, where, after his wound was dressed, he insisted upon the Skyeman staying and drinking with him. This he did, drinking with the wounded man until a late hour, when they separated the best of friends, with kisses and embraces after the fashion of the country. His next encounter was in Ireland, his regiment being afterwards stationed in Dublin. In another regiment, also stationed at Dublin, was an Irishman, named Maclean, who was a giant in size, and possessed of great muscular strength. One of this man's officers, a Lieutenant Maclean, was anxious to get up a match between the Irish champion and Macleod, and for this purpose waited upon Captain Macdonald, of the Royal Scots, and begged the required permission. The Captain readily consented, having every confidence in 'the agility, experience, and skill of his favourite serjeant. The contest created great interest among the officers and men of both regiments, and a large amount of money was laid in bets on the result. Macleod was now in his twenty-sixth year, and, though not a big man—his height was only five feet seven—he was so uncommonly active and such a known master of his weapon, that his backers had no fear of his success. When the two met, they took a good look at one another, whereupon the Irishman said, "I hear you are a good swordsman, will you fight me for five guineas?" "As you are a Maclean," replied Donald, "it shall not cost you so much; I will, for the name's sake, fight you for one guinea." They then, to show there was no ill-will between them, formally shook hands, when the Irishman squeezed Macleod's to such effect that he roared out with the pain, creating great laughter among Maclean's friends. Macleod, however, soon recovered his composure, and made a mental vow that the squeeze should cost the Irishman his right arm. Before they began the combat, Maclean, who was proud of his great muscular strength, made a bet of two guineas that Macleod could not turn his wrist from the position he should place it in. The bet accepted, Maclean laid his right arm flat on a table; when Macleod, by a sudden jerk, turned it, and won the wager, much to the Irishman's disgust, as this was one of the feats at which he had never yet been beaten. The duel now commenced in earnest, and in spite of Maclean's great height and strength, Macleod's skill won the day, ending by cutting off his opponent's right arm; when he was declared the winner amid the applause of his friends of the Royal Scots. In 1715 Macleod's regiment was ordered to Scotland, to assist in subduing the Rising under Lord Mar. They joined the main army, under the Duke of Argyll, at Stirling, while the Earl of Mar's army was quartered at Perth. Among his followers was a noted Highland cattle-lifter, from Knoydart, named Captain Macdonald. This man was an excellent swordsman, and boasted that he could beat any man in Argyll's army. Lord Mar, having faith in the man's strength and skill, and wishing to keep up the spirit of his followers, gave his permission to Macdonald to challenge any single man in the opposing army to single combat. Macdonald accordingly appeared before the Duke of Argyll, accompanied by a trumpet from Mar, and boldly challenged any man among his followers to single combat. The Duke, who was an excellent swordsman himself, had no objection to the display, and, on Serjeant Macleod being pointed out to him as the most suitable man to accept the gage of battle, gave his permission for the duel to take place. The combatants met at a place appointed, about half way between the two armies. Before beginning the combat, Macdonald pulled out a flask of whisky, and offered Donald a drink; but, though fond enough of a dram, Macleod knew this was not the time to indulge, so he refused, and the two went at it Macleod soon found himself master of the position; but, having no grudge against his opponent, he wished to close the fight without bloodshed, so, with a rapid pass, he cut off the Captain's sporran, and, then, demanding a parley, exclaimed, "I have cut off your purse; is there anything more I must cut off before you give up?" Macdonald, finding himself no match for Macleod, reluctantly owned himself beaten, and, leaving his sporran behind him in token of his defeat, went back with a very bad grace to his comrades. The Earl of Mar was so pleased with Macleod's skill, that he sent him a present of ten guineas, which the Duke of Argyll supplemented by another ten, so that Donald made a good day's work, besides getting all the honour of victory. A battle there was, which I saw, man." Donald made himself conspicuous by the havoc his trusty broadsword was making in the ranks of the enemy, and so attracted the notice of a brave French officer, who, on this occasion, had the courage to fight him, but by one powerful sweep of Macleod's sword his head was severed from his body. A French horseman, seeing his officer fall, sprang forward to avenge him, but, fortunately for Macleod, a small water-course lay between him and the Frenchman, though it did not prevent the latter from reaching the Highlander with his long sword, and wounding him in the shoulder. The pain produced roused Macleod to frenzy, and, with a wild yell, he leaped the stream, and plunged his sword in the body of the Frenchman's horse, which at once fell with its rider; but the latter managed to give the Skyeman a fearful cut on the head, fracturing his skull, and laying open his brain. The infuriated Celt, however, kept his feet long enough to dispatch his opponent, and afterwards to tie up his own broken head with his pocket handkerchief, "for fear," as he said, "it should fall in two halves." He was then carried to the rear, and afterwards taken to Stirling. When able to be moved, he was sent to Chelsea Hospital, where he remained until his wound was sufficiently healed to admit of his joining his regiment. Some time, about the year 1720, while stationed in Newcastle, Macleod heard that a Highland Regiment was to be raised for the service of the Government. It was proposed that the regiment should be composed of independent companies, under different leaders, for the purpose of preventing the numerous robberies then so prevalent in the Highlands, for enforcing the law, and keeping the peace of the country. It was understood that the men should not be expected nor asked to go on foreign service, but only to act as Fencibles at home. Lord Lovat was to have the command of one of the companies. Macleod immediately resolved to join this regiment, though, by doing so, he would lose his position and pay as a serjeant in the regular army. For this purpose, he waited upon Major Wm. Scott, the senior officer then with the Royal Scots, and told him he had come to seek a favour of him. "You deserve any favour, Macleod," said the good old Major, "that I can grant; but I first desire the favour of you to take a dram." This request being readily complied with by the Highlander, he told Major Scott that he wished to have his discharge from the regiment. The Major expressed his astonishment at this request, especially as he knew that Macleod stood high in favour with Lord Orkney and with all the officers, and that it was generally understood that he would, at no distant date, be raised to the rank of a commissioned officer. He argued with Macleod at some length on the folly of giving up such good prospects, but, finding him immovable, he felt that he had no alternative but to grant his discharge, on condition that he should pay fifteen guineas to pay for another man qualified to take his place and rank. Having obtained his discharge, Macleod made his way to Edinburgh, and presented himself before Lord Orkney. "How now, Macleod? How do ye do? Is all the regiment well?" "Yes, please your Lordship; but I have left the regiment;" showing at the same time his discharge. "Who dares," exclaimed his Lordship, with an oath, "to give a discharge to any man in my regiment without consulting me?" Macleod then explained how he had requested the favour, and was promised it before Major Scott knew the nature of it, and soon pacified his Lordship, who, though a hasty man, was also a good tempered one. Calling to his servant, he asked him to ascertain how much he was indebted to Macleod. On being told that the sum of £20 was due, the Earl declared, with a volley of oaths, that he had not enough to pay that amount. "Never mind, my Lord," Macleod replied, who well knew that his Lordship was generally poor, "I will wait, when it may be convenient, on your Lordship's mother, the Countess Dowager of Orkney, as I have done before." He then took his leave of his Lordship, who shook him heartily by the hand, at the same time telling him that he was a great fool to leave the regiment. Macleod soon found his way to the Countess, who had often stood paymaster for her son; and she readily paid him, and took his receipt, for all his demands. Being all impatience to offer his services to Lord Lovat, Macleod set out on foot from Edinburgh about three o'clock one summer morning, and at about the same hour on the second day after, he stood on the green of Castle Downie, Lord Lovat's residence. During this long journey Macleod took only the simplest food, which he carried with him, washed down at intervals with draughts of mountain dew. Nor did he go to bed the whole time; but once or twice slept in the open air by the road-side for an hour or two. 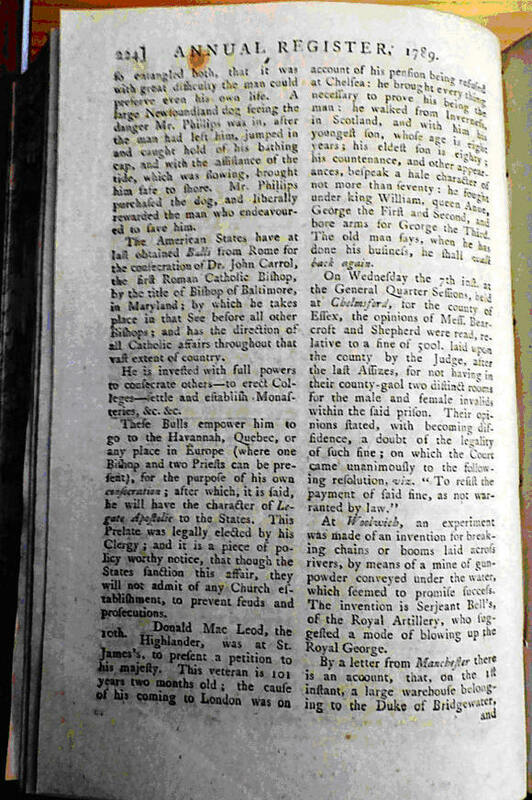 The following interesting description of Lord Lovat and his interview with Macleod, is taken from the pamphlet already referred to:—" As Macleod walked up and down on the lawn before the house, he was soon observed by Lord Lovat, who immediately went out, and, bowing to the Serjeant with great courtesy, invited him to come in. Lovat was a fine looking, tall man, and had something very insinuating in his manners and address. He lived in all the fulness and dignity of the ancient hospitality, being more solicitous, according to the genius of feudal times, to retain and multiply adherents, than to accumulate wealth by the improvement of his estate. As scarcely any fortune, and certainly not his fortune, was adequate to the extent of his views, he was obliged to regulate his unbounded hospitality by rules of prudent economy. As his spacious hail was crowded by kindred visitors, neighbours, vassals, and tenants of all ranks, the table, that extended from one end of it nearly to the other, was covered at different places with different kinds of meat and drink, though of each kind there was always great abundance. At the head of the table the lords and lairds pledged his lordship in claret, and sometimes champagne; the tacksmen or duinwassels, drank port or whisky punch; tenants or common husbandmen, refreshed themselves with strong beer; and below the utmost extent of the table, at the door, and sometimes without the door of the hail, you might see a multitude of Frasers, without shoes or bonnets, regaling themselves with bread and onions, with a little cheese, perhaps, and small beer. Yet, amidst the whole of this aristocratical inequality, Lord Lovat had the address to keep all his guests in perfect good humour. 'Cousin,' he would say to such and such a tacksman, 'I told my pantry lads to hand you some claret, but they tell me ye like port and punch best.' In like manner, to the beer-drinkers he would say, 'gentlemen, there is what ye please at your service; but I send you ale, because I understand ye like ale best.' Everybody was thus well pleased; and none were so ill-bred as to gainsay what had been reported to his Lordship. Donald Macleod made his compliments to Lovat in a military air and manner, which confirmed and heightened that prepossession in his favour, which he had conceived from his appearance. 'I know,' said he, 'without your telling me, that you have come to enlist in the Highland Watch. For a thousand such men as you, 1 would give my estate!' Macleod acknowledged the justice of his Lordship's presentiments; and, at his request, briefly related his pedigree and history. Lovat clasped him in his arms, and kissed him; and, holding him by the hand, led him into an adjoining bed-chamber, in which Lady Lovat, a daughter of the family of Macleod, lay. He said to his Lady, 'My dear, here is a gentleman of your own name and blood, who has given up a commission in Lord Orkney's regiment, in order to serve under me.' Lady Lovat raised herself in her bed, congratulated his Lordship on so valuable an acquisition, called for a bottle of brandy, and drank prosperity to Lord Lovat, the Highland Watch, and Donald Macleod. It is superflous to say, that in the toast, the Lady was pledged by the gentlemen. Such were the customs and manners of the Highlands of Scotland in those times. By the time they returned to the hail, they found the Laird of Clanronald, who, having heard Macleod's history, said, 'Lovat, if you do not take care of this man, you ought to be shot' His Lordship immediately bestowed on him the same rank, with somewhat more pay than he had in the Royal Scots, and, after a few days, sent him away to recruit." DONALD MACLEOD passed the next twenty years of his life in the Highlands of Scotland. He was promoted by Lord Lovat to the lucrative post of Drill-Serjeant,. the duties of which position he fulfilled to the entire satisfaction of his officers. His leisure hours were agreeably spent in hunting, fishing, and practising with his favourite broadsword. One of the principal reasons for the regiment being raised was to put down the numerous cattle-lifters or gentlemen- robbers, as they were called, which at that time were so plentiful in the Highlands, and who, by their daring and dexterity in avoiding capture, had become a terror to all the peaceable inhabitants. Tracking out and apprehending these desperadoes was a work of no little difficulty, requiring both intelligence and courage. Donald Macleod was found especially suited for the work, and was often employed in it. "Jamie, what did you do with the thirty head of cattle you drove away from the Laird of Glen Bisset's, and the six score, or thereabouts, that you took away from the lands of Strathdown? "Serjeant Macleod, let me go for this time, and neither you nor the country will be troubled with me any more." "Jamie, I cannot let you go; you have slashed many men, and stolen many horses and cattle. How many straths are afraid of you? No, Jamie, you must go with me." "Serjeant," replied Stewart, "let me go this time and I will give you a hundred guineas." "It was not for guineas, Jamie, that I came here this day, and rather than be drawn off from the duty of a soldier for a few guineas, I would go with you and steal cattle." Finding bribery of no avail, Stewart had recourse to entreaty in which he was joined by his wife and four young children, who clung around Macleod with tears and sobs. The affecting sight was too much for the tender-hearted Serjeant, so he agreed to a compromise to the effect that he would not seize Stewart, this time, if he would give up all the cattle he had lately stolen, and also provide refreshment for the thirty men on guard outside. These conditions were thankfully accepted, and Stewart anxiously pressed his visitor to accept at least a portion of the money offered him before; but Macleod would not take a single penny. When his men were rested and fed, they collected the cattle, and drove them to their respective owners, who were much better pleased at getting their property back than even if the robber himself had been apprehended. Before charging Macleod with not doing his duty on this occasion, it must be borne in mind that at this time the Highlands were in a very lawless state, and to the military, who acted as detectives, policemen, and often as judges, a very great deal of discretionary power in cases of this kind was allowed and exercised by officers of all ranks. On another occasion Macleod was tempted to compromise with a thief, although his motive for doing so was not so disinterested as in the former instance. He was sent in command of a small party to apprehend a notorious horse-dealer, named James Robertson, who lived in Athole, and who stole the horses first and then sold them. The distance was long, the day warm, and the Serjeant, who always liked his dram, stayed rather too long and drank rather too deeply at Aberfeldie, so that by the time he reached Robertson's house he was somewhat elevated. The wily horse-thief was at no loss to account for the soldier's visit, and, seeing his condition, did his best to keep him in good temper, and protract the time so that he could have a chance of making his escape. Robertson had four very handsome daughters, with one of whom Macleod was much taken. The young woman, at a sign from her father, encouraged Macleod's attentions, until at length Macleod proposed to marry her. Robertson now saw his advantage, and would only listen to Macleod's proposal on condition that he should himself be allowed to escape on giving up possession of the horses he had stolen. The amorous Serjeant agreed to this, only stipulating that the marriage should take place at once. This was accomplished by the easy ceremony of acknowledging Miss Robertson as his wife before witnesses. He then dismissed the men under his command to a small village at a little distance where he would join them in the morning. Robertson, however, was not satisfied with the bargain, and he no sooner saw Macleod retired for the night than he sent privately for four young men, his neighbours, one of whom had been a suitor for the newly- made bride, to come and attack Macleod, who, he thought, in his present state, would prove an easy victim. In this, however, he found himself mistaken, for no sooner did the valiant Serjeant hear the noise made by the young men entering the house than be sprang up, seized his trusty sword, and laid about him with such good will that he soon put all four of them to flight. Robertson tried to make him believe that the young men had come to the house by accident, but the enraged Highlander would not believe him; but, calling him a liar and a traitor, swore he would seize him and give him up to justice, which he doubtless would have done, had not Robertson's daughter, whose charms had so captivated him, here come to the rescue, and throwing her arms round Macleod's neck, with many tears and kisses, begged him to let her father go. Her entreaties at length prevailed, and her father was allowed to escape on giving up the stolen horses. The marriage, so hastily arranged, turned out a happier one than might have been expected; for, in the account of his after life, it is stated that he cherished her as every good and tender husband ought to cherish his wife, until she died in child-bed of her first child, a boy, who afterwards became a thriving tailor in Edinburgh. Towards the close of the year 1739 the independent companies of the Highland Watch were increased by four additional companies, and the whole formed into a regiment—the 43d— now the 42nd Royal Highlanders, under the command of their first Colonel, John, Earl of Crawford. About a year afterwards they were somewhat surprised at being ordered to London, because when the independent companies were raised it was distinctly understood that they should not be called upon for foreign service, nor at any time to serve out of their own country. The suspicions of the men were roused, but on being assured that the only object of their going to London was to be reviewed by the King, who had never seen a Highland Regiment, they went cheerfully enough. During their progress through England they were everywhere well received and hospitably treated, so that they entered London in high spirits and with perfect confidence. Here, however, their former suspicions of unfair dealing returned with redoubled force, on finding that the King had sailed a few days before for Hanover. The populace, too, treated them to taunts and sneers, which the Highland blood could ill brook, and, to crown all, certain Jacobites industriously circulated reports that the regiment had been inveigled to London for the purpose of having them transported to the colonies, and so rid the country of a lot of Jacobites at one blow. Unfortunately these misrepresentations were too readily believed, and the greater part of the regiment broke out into open mutiny. We quote the following description, by the biographer of Macleod, as it places in a somewhat different light, the account of the outbreak given by the historians of the period:- "What happened on that occasion falls within the memory of many persons now living (1791), and will be long remembered as an instance of that indignant spirit which justice and broken faith inspire on the one hand, and of that gradual encroachment which executive and military power are prone to make on civil liberty on the other. Many gentlemen's sons and near relations had entered as private men into the Highland Watch, under the engagement that they should never be called out of their own country. That promise, made long before, in times of peace, was forgotten amidst the present exigencies of unsuccessful war, and it was determined to send the Highland companies as a reinforcement to the army in Germany, under the Duke of Cumberland. A spirit of resistance and revolt, proceeding from Corporal Maclean, pervaded the whole regiment The whole of the Guards, and all the troops stationed about London, were sent to surround the Highlanders, quell what was now called a mutiny, and reduce them to obedience. A great deal of blood was shed, and lives lost on both sides. The long swords of the Horse Guards were opposed to the broadswords of the Highlanders, in front, while one military corps after another was advancing on their flanks and rear. Yet, in these circumstances, a considerable party of them forced their way through the King's troops, and made good their retreat northwards on their way home as far as Yorkshire, where, being overtaken by a body of horsemen, they took post in a wood, and capitulated on safe and honourable terms. But, in violation of the engagements come under on that occasion to the Highlanders, three of them, among whom was the high-spirited Corporal Maclean, the prime mover of the secession, were shot, the rest sent to the plantations. Though Serjeant Macleod was not of the number of the seceders, he was indignant at the usage they had met with, and some of the Horse Guards bore for years marks of his resentment. But the less that is said on this subject the better. The Highland Companies, or the 42nd Regiment, were-now sent over to the Low Countries, and to Germany, where they were engaged in different battles, and particularly that of Fontenoy, in which Serjeant Macleod was not a little distinguished." As an instance of Macleod's coolness under fire, it is related that during the thickest of the fight at Fontenoy, he, having killed a French Colonel, deliberately served himself heir to 175 ducats and a gold watch which he found on his slaughtered foe. He had scarcely secured his booty when he was fiercely attacked by a Captain James Ramievie, an Irishman in the French service, whom, after an obstinate and skilful combat, Macleod killed. The next moment he was beset by three or four Frenchmen all at once, and was very hard pressed, when a gentleman of the name of Cameron, who, although in the French service, came to his rescue. The gentleman's Highland heart warmed at the sight of the tartan, and he could not see a countryman in such straits without rendering help. Naturally, after such an episode, he could not remain in the French service, and he immediately joined his countrymen of the 42nd. In this same battle of Fontenoy, Macleod received a musket ball in the leg; but refusing to fall behind, he hastily bound up his wound, and was among the first that entered the trenches. In 1745, when the Duke of Cumberland and his army were recalled in hot haste to oppose Prince Charles, it was not thought advisable to take the 42nd Regiment, which had been reinforced after Fontenoy by a large number of recruits fresh from Scotland, along with the rest of the army. Accordingly they were ordered to different home stations, and at last sent over to Ireland, where they remained over ten years; and in the various encounters with the "Whiteboys," "Hearts of Steel," and the other insurgents, Macleod had ample opportunities of exhibiting his prowess and skill as a swordsman. While stationed in Ireland he was on one occasion ordered to Scotland to recruit, and on his way stayed a day or two in Belfast, where he met with an adventure. There resided in that city a Scotchman named Maclean, a native of Inverness, and a tailor by trade. This man was a fair swordsman, and thinking himself invincible he had the temerity, when elevated by drink, to challenge the redoubtable Highland champion to a trial of skill. Macleod consented, but seeing the tailor flustered, and not wishing to take an unfair advantage of him, he advised him to reconsider the matter, and if he still felt determined to fight he would meet him next day. This proposal the excited tailor chose to consider insulting, and nothing would do but to fight then and there. The two combatants, with their seconds and a crowd of onlookers, adjourned to a field outside the city, and the duel began. The tailor was not without skill in the handling of his weapon, had plenty of courage, was very nimble, but withal was no match for Macleod, who contented himself at first with merely parrying the other's quickly delivered blows. At length, getting annoyed at the man's obstinacy, Macleod cut off one of his ears, then, in a second or two, the other ear was severed similarly; yet Maclean would not yield, swearing he would rather die a thousand deaths than yield to a Macleod, when the Serjeant, in self-defence, continued the fight until he disabled his opponent by finally severing one of the sinews of his leg, thus bringing him to the ground. In 1756 the 42nd Regiment embarked for America, and soon after Macleod was drafted from it to the 78th, commanded by General Fraser, to fill the advantageous station of Drill-Serjeant. During this campaign Macleod. became personally known to General Wolfe, who, finding that to undoubted courage and great experience Macleod could add a tolerable knowledge of the French and German languages, often employed him on occasions requiring both address and resolution. He always acquitted himself to the General's satisfaction, acknowledged by handsome presents and promises of future preferment, which promises, alas! the gallant young officer did not live to fulfil. At the siege of Louisburg Macleod greatly distinguished himself by volunteering with a handful of men to surprise the French outpost, the latter being cut off to a man. He afterwards. received a musket ball on his nose, which was most painful at the time, and caused him more inconvenience afterwards than any other of his numerous wounds. At the glorious battle of Quebec he was among the foremost of the Grenadiers and Highlanders who drove the shaking line of the enemy from post to post, and ultimately completed their defeat. In this action he had his shin-bone shattered by grape shot, and had a musket ball through his arm. While being assisted in this disabled state to the rear by his comrades, he heard with unmitigated grief that his beloved General Wolfe had been struck down. He immediately offered his plaid for the purpose of carrying the wounded General off the field, and he had the melancholy satisfaction of having it accepted and used for that purpose. In consequence of his wound, Macleod was invalided home, and had the honour of being one of the guard deputed to take charge of the body of General Wolfe on the journey to Britain, in November 1759. In December of the same year he was admitted an out pensioner of Chelsea Hospital, which was all the recognition ever given at headquarters for the long services of the hardy veteran, then in his 71st year. Macleod did not, however, consider himself an old man at this age, and no sooner were his wounds healed, and his strength restored, than, hearing that some new companies were being raised in the Highlands for the war in Germany, he applied to Colonel Campbell to enlist him as a volunteer. His services were accepted, the rank of Paymaster-Serjeant was bestowed upon him, and he was ordered to go north to recruit. It was while on this service at Inverness that he met with and married his last wife, Mrs Jane Macvean, who afterwards accompanied him with his regiment to Germany, where he served throughout the campaign, and was twice wounded, once by a musket ball, which went in an oblique direction between two of his ribs and his right shoulder, and again by a ball in the groin, which could not be extracted, and which caused him great pain and inconvenience during the rest of his life. After peace was proclaimed, he received pay for two or three years from Chelsea Hospital as an out pensioner, during which time he returned and worked at Inverness at his original trade of mason. The constant use of the mall was, however, more than his strength could now bear, and threatened to reopen some of his wounds. He therefore returned to England, invested his savings in the purchase of a small house in Chelsea, in which he lived for the succeeding ten years, rearing up a large family, yearly increasing, and working in an extensive manufactory of white lead, at which he earned good wages. In 1776, hearing that his countrymen had again embarked for the seat of war in America, Macleod could not restrain his longing to be once more actively engaged in the profession he loved, so settling his house, furniture, and what little money he had on his wife and children, he bid them good-bye, took passage to America, landed at New York, from thence made his way to Charleston, and, presenting himself before Liçutenant-General Sir Henry Clinton, whom he had known and served under in Germany, offered himself as a volunteer. Sir Henry, struck with the military ardour and indomitable spirit of the old man, allowed him to remain with the army as a Drill-Serjeant, and very liberally gave him an allowance out of his own pocket of half-a-guinea a-week. When the army began to move northwards, and was likely to be actively engaged, the General, pitying the old man, made an excuse to send him home with despatches to the Government Having faithfully performed this service, and finding that he had no further prospect of being employed in the army, Macleod resolved to return to the Highlands, and settle down quietly for the rest of his life. He accordingly sold his house in Chelsea, which realised some two hundred pounds. This sum, with other small savings which he had deposited from time to time in the hands of Mr Alexander Macdonald, a clerk in the King's Office, Chelsea, was all his worldly fortune. As Mrs Macleod was very much afraid of going by sea, her husband arranged for her and the children to pursue their journey to Inverness by land, while he, with the chief part of the money and several large trunks, full of arms, clothes, and other articles on which he laid great value, set sail in the "Margaret and Peggy," of Aberdeen, Captain Davidson, master. This voyage turned out most disastrously, for, when on the Coast of Yorkshire, the ship was overtaken in a severe storm, driven on the rocks, and completely wrecked, our old soldier being the only passenger saved, by having himself lashed to a plank before the vessel sank. He was thrown by the waves on the beach, and was picked up more dead than alive between Whitby and Scarborough, and taken to the house of a hospitable gentleman named Boyd, who originally came from Ayrshire. Here he was treated with great kindness for several days, and as his own clothes were rendered almost useless by the sea and the rocks, Mr Boyd supplied him with some of his own, and though Macleod had a gold watch in his pocket and a ring of some value on one of his fingers, his kindly host insisted on his accepting a present of two guineas. With this sum he started, after taking a grateful farewell of his benefactors, to make the best of his way overland to Inverness. He went first to Durham, from thence he made his way to Newcastle, where, unfortunately he fell in with some old comrades with whom he had served in many an arduous campaign. Their joy at again meeting with each other was so great, and their temperance inclinations so small, that the remains of the two guineas given him by Mr Boyd was soon melted. His watch and ring was next utilized to procure the means of conviviality, and the drinking bout only ended from the want of any more means to prolong it. "Easter Duddington, 30th December 1785. With the timely assistance thus rendered, by his noble relative, Macleod was enabled to continue his journey in more comfort, and at length arrived in Inverness, little better off in worldly goods than when he left it more than half a-century before as a runaway apprentice, with the exception that he now had an affectionate wife and flourishing family, who had been for some time anxiously awaiting his arrival. From 1780 to 1789 he lived in Inverness, making a living by working a little at his old trade of mason, supplemented by the small pension he received from Chelsea Hospital; but in the latter year, finding that, through some neglect or error, the usual remittance was not paid, he determined, with characteristic energy, to go to London to see after it. Accordingly, in the summer of 1789, he started, accompanied by his wife, to walk to London, which they reached in the beginning of August, and at once found out, and laid his situation before, Colonel Small, a gentleman of great philanthropy, universally respected, and under whom Macleod had served for several years both in Ireland and America. The Colonel received him most kindly, entertained him at his own house, and allowed him 1s. a-day of pocket-money as long as he remained in London. By the advice of this gentleman he drew out a memorial and petition, setting forth his long services and misfortunes, and praying that he might have what was called the King's letter; that is, that he should be placed on a list of persons recommended by the King for a pension of a shilling a-day for life, for extraordinary services. By the aid of Colonel Small and other officers, Macleod had an opportunity of presenting his petition to the King in person. We quote the description of this interview with Royalty:- "The very first day that his Majesty (George III.) came to St James's, after his indisposition, Macleod, admitted to the staircase leading to the drawing-room, presented his petition, which his Majesty graciously accepted and looked over as he walked upstairs. At the head of the stairs the King called him. The old Serjeant was going to fall on his bended knee, but his humane sovereign, respecting his age, would not suffer him to kneel, but laid his hand upon the old man's breast, and, making him stand upright, expressed no less surprise than joy at seeing the oldest soldier in his service in the enjoyment of so great a share of health and strength. The sentiments that filled his own royal breast he eagerly expressed to the different noblemen and gentlemen that were near him. He gave it in charge to a gentleman present to take care that the prayer of his petition should be granted." The name of Donald Macleod was accordingly placed on the list, and this knowledge, together with ten guineas received out of his Majesty's own hand, sent the old man and his wife on their way rejoicing back to Inverness. The irony of fate, however, still pursued the worthy couple, for although Maclod's name was duly placed on the list, it appeared he would have to wait for the actual receipt of his shilling a-day until there should be a vacancy, the number of recipients being limited. This was more than the patience of the old soldier could stand; his King had promised him a shilling a-day, and that shilling a-day he was determined he would get, so, once again, he and his wife, accompanied this time by their youngest child, a boy of nine years, set out again from Inverness on the long walk to London. On his second appearance in London, the hardships of his case attracted a good deal of attention, and Macleod made many influential friends who interested themselves on his behalf. It was on this occasion, in 1791, that the life and adventures of the hardy old veteran, from which we have our information, was written and published, for his behoof. A portrait of him was issued at the same time, which found a ready sale. Among others who showed him kindness was the celebrated scholar, Dr Rutherford, who invited him to visit him at Uxbridge, and give him an exhibition of his skill with the broadsword at the Academy before his pupils. After returning from Uxbridge, and leaving the stage coach, Macleod was in the evening walking down Park Lane, when he was set upon by three footpads. Though armed only with a short stick he knocked one of the rascals to the ground, but the other two crept up behind him, threw him down, and robbed him of sixteen shillings. The poor old man was much shaken and bruised, but still more hurt in mind at having been overcome by the villains. During this visit an affecting and interesting incident occurred to him. One day while he, his wife, and youngest boy were walking in a suburb of London, they were overtaken by a young man, who entered into conversation with them; and soon finding they were from the Highlands, asked their name, and what part they came from. "My name is Macleod," answered the old man, "my native county, and usual place of residence, is Inverness." The young man eagerly sought for further information, and on being told that the old man's name was Donald, and that he had served so many years as Serjeant in a Highland regiment, he burst into tears. Macleod looked on with astonishment, but his wife, after looking earnestly at the stranger, burst into tears and threw herself sobbing into his arms, exclaiming, "O, Serjeant Macleod, do you not know your own child?" And such, indeed, he turned out to be. This young man, John Macleod, had left home some ten years before to seek his fortune. He was a gardener by trade, and found good employment in England, but never stayed long in any one place. This circumstance, and the unsettled movements of the old Serjeant himself, had prevented them hearing anything of each other so long that each concluded the other was dead; and their mutual joy at thus so accidentally meeting again was great and unrestrained. Our account of Macleod's life ends at this period, and we have no means of ascertaining what afterwards became of him; whether he lived to return to Inverness and enjoy his hardly-earned pension, or whether his long lease of life was soon ended. When his biography concludes he was in the enjoyment of good health and spirits, and in his 103rd year. He could not remember the exact number of his children by his different wives; and some of whom he had lost sight of for years; but he knew of sixteen sons then living, the eldest of whom was past eighty, and the youngest nine. Twelve of them were in the King's service, either as soldiers or sailors. He had also several daughters, who had married well. He was still wonderfully active, and when asked as to his mode of life, he replied, "I eat when I am hungry, and drink when I am dry, and never go to bed but when I can't help it." It appears that he would never retire to bed until his eyes closed, whatever time of the night it might be, and the moment he awoke he would spring up, wash, dress, and go out for exercise or for some duty or other. He seemed to have a great aversion to rest, and was always in motion. His faults were not so much of the heart, as of the fashion of the times in which he lived and the sphere of life in which he moved, while his virtues were characteristic of his race and country. High- spirited, courageous, even to rashness, yet tender in domestic life, generous, hospitable, and with a keen sense of honour, his was a character to admire, and his extraordinary adventures claim our sympathy and command our interest. M. A. ROSE. Thank you for your email concerning Donald MacLeod presenting a petition to King George III in 1789. I have checked through our indexes but I am afraid that I have been unable to find any mention of Donald MacLeod, however our records for the Georgian period are not complete. Although, please find attached a scan of a page from the 1789 Annual Register, which records that on the 10th October Gordon MacLeod presented his petition to King George III, which I hope you will find of interest. I am sorry that we are unable to provide you with a more detailed answer to your enquiry.